T-shirts designed by HRH Princess Siribha Chudhabhorn and friends from Silapakorn University to raise money for Nong Nam Khun Temple’s murals project are shown being sold at Central Airport Plaza. Profits from the sales, at 399 and 499 baht each, will be donated to the temple in Rayong, which is under the royal patronage of HRH Princess Soamsawali. A representative and committee member of Chiang Mai University Alumni Association is pictured presenting a donation of 1.2 million baht to the Chiang Mai governor and President of the Alumni Association Amornphan Nimanant, seen left. The donation, raised through the organising of a charity golf tournament, will be used by the association’s public charities. 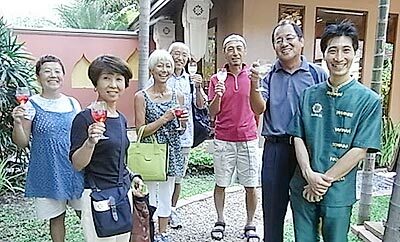 Japanese expats pictured enjoying a traditional Japanese Tea Party at Lanna Oasis Spa, on August 2. The event was designed to create a strong network amongst the Thai and Japanese communities living in Chiang Mai. The party featured a Lanna Thai Spa demonstration and served a healthy Spa cuisine. 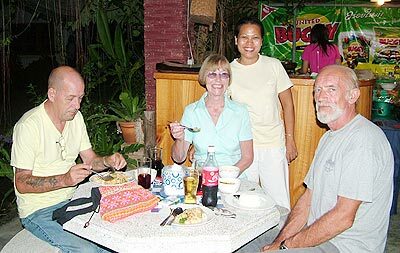 Pictured are Carol and Eric Bowe, (seated left), happy to be back home after a 5 week trip to the UK, enjoying a meal with a neighbour at Khun Pa’s newly opened San Sai eatery. Sun Suebsaeng, (left), of the Dhara Dhevi Hotel Co Ltd and owner of the Tengoku Japanese Restaurant, with his assistant Nong Soft, (right), were on hand to welcome the Chiang Mai Mail’s editor Phitsanu Thepthong, (centre), Elena Edwards, the paper’s executive editor, and Brian Baxter on their visit to the newly-opened restaurant.